And We’re Off! First Stop? The City at the End of the World! So the adventure begins! Giddyup! We hope you’ve enjoyed our premiere episode! How cool was that? 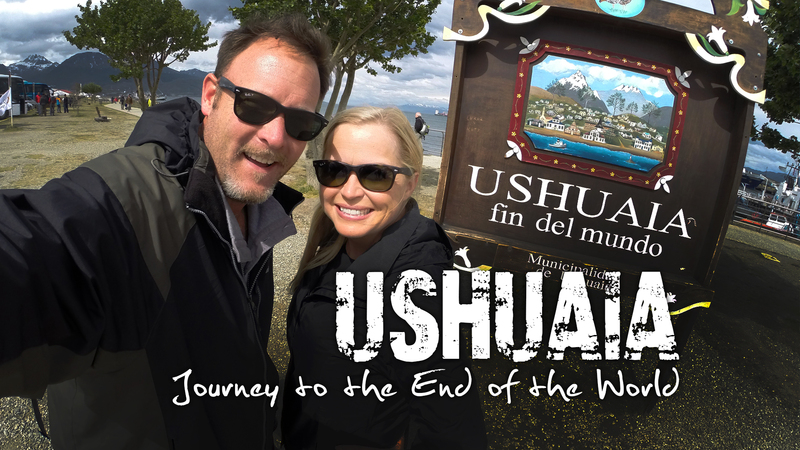 From the king crab in Ushuaia, the scenery of Tierra del Fuego National Park, and the southernmost post office in the world (outside of Antarctica)… to crossing the Drake Passage on the Akademik Ioffe and seeing our first iceberg! And then…. the ending! Dramatic enough for you? 🙂 Crazy, crazy stuff. And it only gets better. As promised at the end of the show, we’ve got lots more stuff to go along with every episode and every destination here on the website, along with our blog, lots of groovy photos, more about us and – coming soon – the Two for the Road podcast series! So, yeah. We hope you’ll follow us along on social media of course, but this website is our official on-line headquarters! So keep coming back regularly for updates, and better yet – subscribe and join the Two for the Road online community! Meantime, for more about the places we visited in our premiere episode, look to the menu at the top of the page where it says “Episodes & Extras,” where you’ll find links to each episode/destination as the season rolls on.